I'd been cooking this on the grill, but I always seem to lose a bit through the grates, so I decided to use this nacho tray (and it's definitely nacho tray :tsk:) to cook them on. I used a bit of olive oil and heated it up > 500* before putting the pork on. I tried to get the pork to brown before turning. We served this on lettuce leaves. 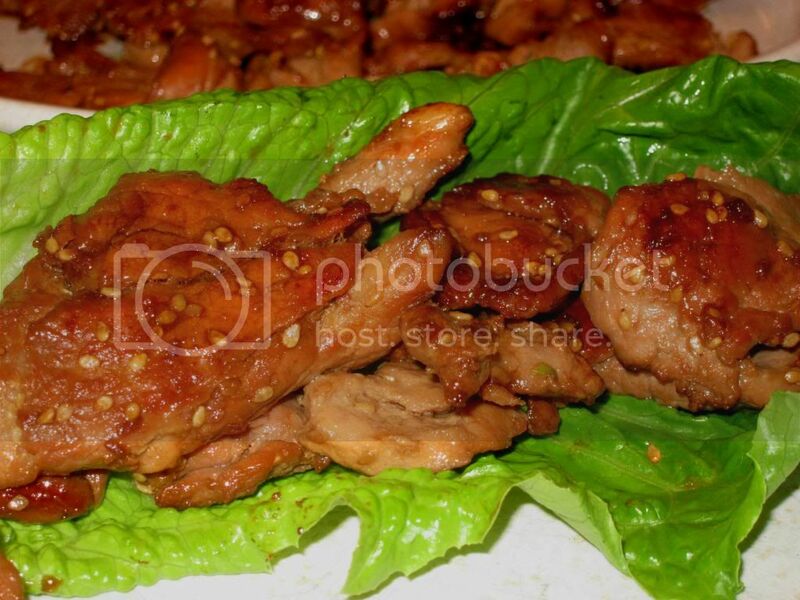 The pork was pretty tasty and a great alternative to beef bulgogi. It also is a different way of cooking tenderloin, other than the half dozen or so we typically do. 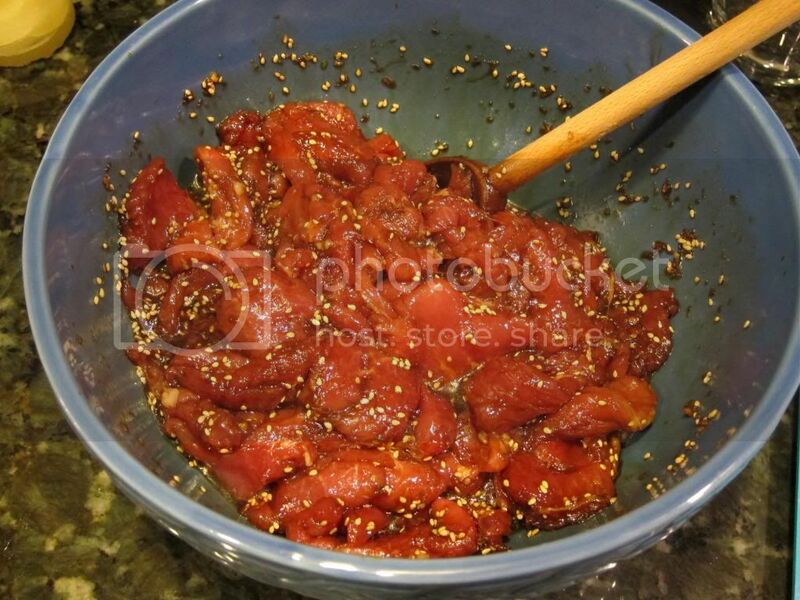 It was also fast, since the marinading takes only about 20 minutes. 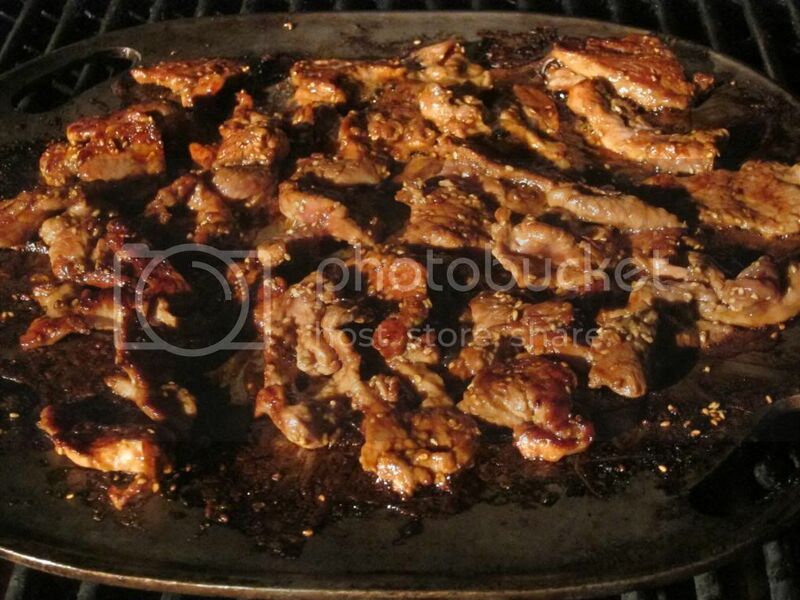 I like the taste of meat cooked directly on the grill better, but the tray made it much easier to cook. That looks really good! I am adding that to my list of must try. That's a great idea, but I believe frogmats are only rated for lower heat. I do have one of those metal vegetable-grilling trays with a bunch of holes it it. I used it before but it was a real pain to clean. Don't get me wrong, this was still very much worth eating and I will be put into the regular rotation, it just could have been a bit better. Naw, Andy and I use them when we grill on the YS460 when we have it cranked up and not burned one up yet. Not sure what the max. temp is but it is pretty high as I remember. The metal baskets are cool too, but get a teflon coated one so it is easier to clean, esp when using a sweet marinade like a bulgogi. Thanks! I checked the frogmat website and they're good to 550*! I had thought it was much lower for some reason. Looks great. Is black soy sauce the same as dark soy sauce? Looks good. Thanks for the idea and recipe. Looks great Gore, I'm going to have to steal that one too. Thanks for the pictures and the recipe, Gore! "Oscar Meyer has a way with b-o-l-o-g-n-a"